Along Marina Boulevard there’s a bicycle and pedestrian path where visitors and residents can stroll along the bay without having to worry about cars — until they get to the stretch between Scott and Baker Streets, where drivers are allowed to enter the path to access 51 parking spaces. 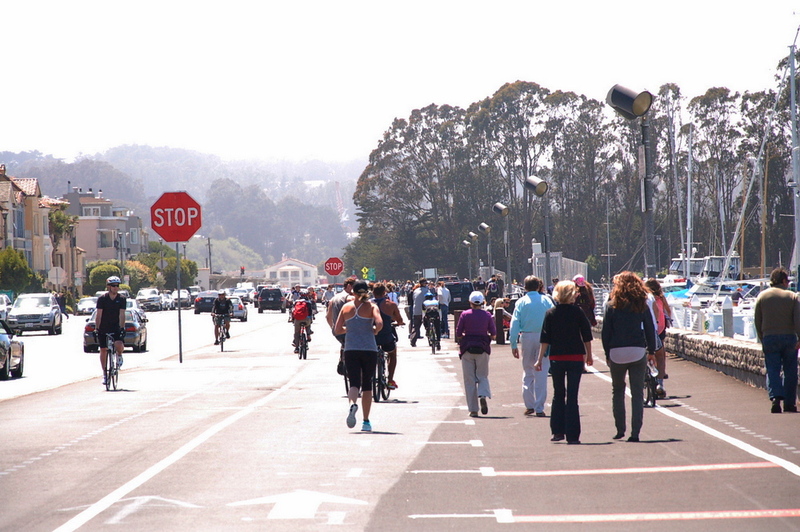 It’s the only part of the 500-mile Bay Trail where people must share space with cars. But now the Department of Public Works is leading an effort to remove those parking spots and ban cars on that stretch of the path. 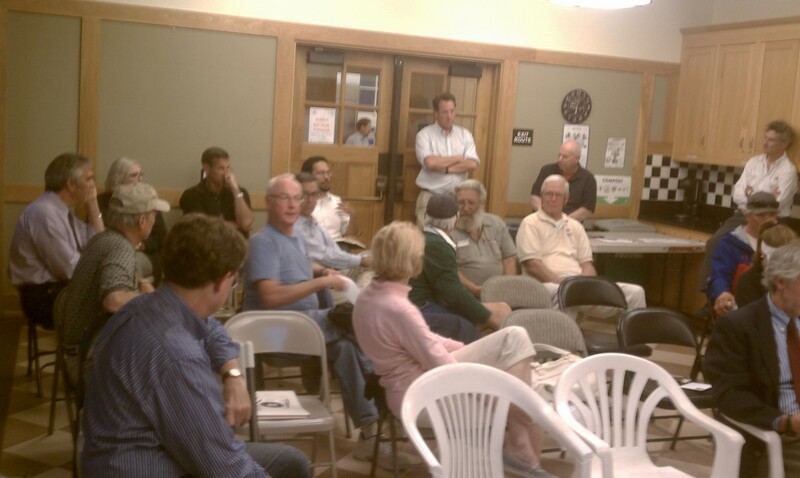 At a public meeting yesterday, the proposal was met with protest from about a dozen boat owners who claimed they were entitled to those parking spaces as part of the $10,000 yearly fee they pay to store their vessels. 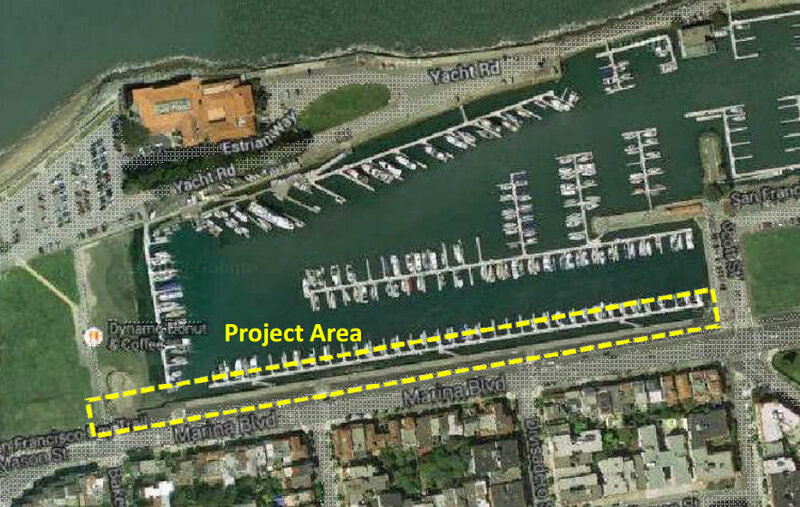 Boat owners complained about longer walks to carry equipment from their cars to their slips, but most users of the marina already seem to make longer walks. The Bay Trail parking spots, which often appear empty, sit adjacent to only 91 of the 350-some-odd total slips in the basin. Attendees also claimed that the city doesn’t have the jurisdiction to remove those parking spaces because boat slip renters are entitled as part of their contracts with the harbor (DPW didn’t have the documentation on hand to refute that). 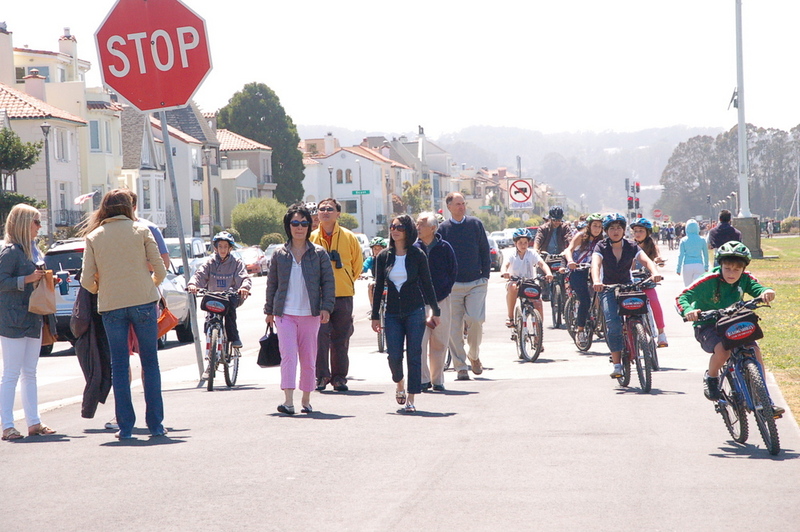 Although the Marina pathway is heavily used by families, many with rental bikes, that didn’t stop a few attendees from repeatedly calling people on bicycles a hazard, while insisting that operating motor vehicles on the path is just fine. “The bicyclists pay nothing. They don’t pay taxes. They’re just out for whatever they can get. And I think it’s time that the citizens of this city say we’ve had enough,” said another man. “The fact is that we, as tenants, are paying for this whole marina and its facility, so don’t do a number on us,” he warned DPW staffers. “There are plenty of marinas on the east coast, where I also live, that have adequate parking,” he added. DPW recently re-paved the pathway, and though agency staff didn’t present any proposals for what they could do to improve the space once cars are removed, they said they would float some at the next community meeting. The agency is looking at locations nearby to replace some of the parking spots off the path. The stretch of pathway in question. It’s a tricky question because for an individual rental, you can say that the rent will be the most the landlord can get (or the most rent control will allow, if applicable) regardless of the property taxes or any other component of cost. But in aggregate, the rent has to cover the costs and give the landlord a reasonable rate of return, or else he would take the rent off the market. So property taxes are ultimately borne by tenants – it’s just not a direct one-to-one relationship. As an aside, what you’re seeing now in SF, with rent control, if that those costs are not always being covered by the rents, leading landlords to invoke the Ellis Act to evict and sell the units as TIC’s. That has the effect of driving up rents anyway. If the best strategy you have is stereotyping people based on their perceived membership of some class that you disapprove of, then you’re losing the battle already. Another example of the loss of civility. Newsflash – everyone in the business of making money will charge as much as they can, so long as people will pay. Think it costs Gillette anywhere near $2.50 to make a razor? I think you’re agreeing with Murph because he is saying that the rent is determined by the market and not by what the costs are. That said, if the result is that you are losing money every month, then you will go out of business. So at least in aggregate rents have to cover costs, meaning that tenants are paying the taxes, albeit indirectly. It’s a particular concern in SF because, since 2/3 of voters are tenants, they will always approve parcel taxes if they think it won’t cost them anything. A free lunch. That is why passthru’s for parcel taxes are so important. Phil – looking at it simply, if renting at market rates means that some landlords go out of business and leave the market, that shrinks the amount of supply without reducing demand, and increases the market price until we hit equilibrium. Econ 101. The argument that aggregate rents have to cover costs is also Econ 101, but the definition of “covering costs” is very complex. “Murph’s Tahoe” has been in business for 16 years and has never cash flowed positive. Of course, in those 16 years the house has doubled in value and I only put 10% down on it, meaning the ownership of the property has been a financial windfall despite the “sea of red ink”. Especially since I have been deducting those losses – some of which are only paper tax losses – off of my taxes but I will *never* pay taxes on the appreciation in property value because I don’t intend to sell the house. If a landlord has a mortgage on the property, is the principal payment part of his “costs”? Not in my view – that money is not going down the drain, it is paying for an asset the landlord gets to keep (and which generally appreciates). If a landlord has no mortgage, does that landlord have greatly reduced “costs”? No – the landlord is paying an opportunity cost because all of his money is tied u. A parcel tax doesn’t cost a tenant anything if they would be unwilling to pay the increase. A tenant at market value would be able to move. Pass throughs really only apply if a tenant is rent controlled below market value such that the alternative to paying the added rent from the pass through is moving out and returning to market rate. I could argue that history shows that stereotyping people based on race, age and gender has been spectacularly unsuccessful. Else we would still have slavery and segregation, and blacks, women and under-21’s would not be able to vote. What changed? Is stereotyping wrong unless it’s against old white males, and then it’s suddenly OK? murphstahoe, I know what you are saying i.e. that tax breaks like depreciation, and the tendency for RE to appreciate over time, can make a property financially viable even if it doesn’t cover its costs. Even so, if you are going to do this on any scale, rather than say a one-off ski cabin in Tahoe (I’m guessing; forgive me) then your properties have to “flow” meaning pay for themselves year-by-year and then some. When it doesn’t then, as you note, LL’s pull out, supply declines and rents rise. This matters politically only in the sense that tenants have to understand that renting doesn’t divorce you from the real world, public bills still have to be paid, and you cannot have a free lunch without paying for it somewhere down the line. That stereotyping has been the driving force behind the 1990’s to now for the GOP, and they have managed to cobble enough votes to put together a majority in the house. You don’t need to get everyone in order to win. I think the whole idea of “they don’t pay [anything/enough/whatever], so they shouldn’t get to decide” is a non-starter. There is nothing that says people should get to decide things based on how much they pay in taxes and fees. So because stereotyping sometimes works, even though it should never work, it’s OK by you? I’m sure you have lots of good debating points in your favor, as you seem like a smart guy. It’s just that stereotyping people isn’t one of them. You’d have to explain that AIG reference in order to gain any traction from what I feel sure you think is otherwise a compelling point. MM, while pay-to-play isn’t the only criterion for getting things done politically, there is a real problem when people vote for things that they know will not cost them anything. If I can get some deal for free then my decision to support that has to remain suspect and selfish. public bills still have to be paid, and you cannot have a free lunch without paying for it somewhere down the line. I’m simply saying that your base assertion that this tactic is ineffective has sadly proven time and again to be untrue. It’s probably most important to understand this not for the sake of using that strategy, but to understand that your opponent may use that strategy and that simply saying “that’s an ad hominem attack” will not win the day. I have been told many times that if I get hit by a drunk driver when riding my bike that it’s my fault for being out there on a bike. While that is victim blaming, simply saying “You are blaming the victim” isn’t going to get me anywhere. Guess what, Murph, young white males grow up into old white males, and become more conservative as they age. You can bet that won’t happen but it really shows the poverty of your position. Argue your point base don the merits and not based on stereotyping those who oppose you. Your position is rather like arguing against civil rights because it is supported by young black females. Little to none of that has anything to do with whether rents cover property tax. Funny thing is I wasn’t even disagreeing with you. Then why doesn’t SF in 2013 match SF in 1950? How do we possibly have something like the Folsom Street Fair? The last several decades have shown that today’s 40 year old may be more “conservative” when he’s 70, but he’ll be a lot less “conservative” than today’s 70 year olds. Regardless – I didn’t know that one of the base principals of conservatism was “Wants parking spots on the Marina Green Pedestrian Path for when they park their yachts”. If there aren’t any younger people advocating for that position, the position will die off. I think it’s a good idea. More power to the pedestrians is a great way to add life to your city. @Upright Biker – Well, they only fund almost half of those highways; the rest comes from the general fund that we all pay for. Nobody knows who's supposed to maintain this path, so it's fallen into disrepair and is now unusable.